Our industrial hose selection is widely used among industrial painters with various spray coatings. Whether you require a Graco airless industrial paint sprayer hose or Wagner airless industrial spray painting hose, you can find the right high pressure hose to solve your fluid dynamics needs. Each of our industrial paint supply hose is rated at a minimum of 5,000 PSI, which allows you to work safely within the surface treatment industry while applying the industrial coating. If a lower pressure hose is needed our contractor finishing equipment hose will surely resolve your fluid handling requirements. All industrial airless paint sprayer hoses are strong, durable and the most common pressure range used for industrial spray painting; however, if a larger industrial paint sprayer is being used then our heavy duty industrial hose might be needed for the extra PSI requirements. 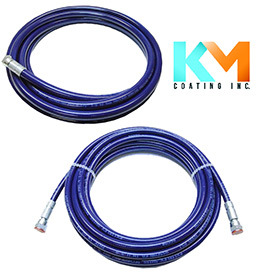 In addition, we offer custom hose assemblies that will allow you to solve those challenging setups and be most effective with your airless spray equipment.